Embattled Peoples Democratic Party (PDP) “National Chairman” Ali Modu Sheriff has described the public conduct of Ekiti State Governor Ayo Fayose as shameful. 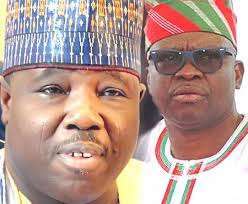 Sheriff was reacting to Fayose’s comment that he was removed as chairman because he was scheming for the 2019 presidential ticket of the PDP and was also baiting some party chieftains with the vice presidential ticket. At a media briefing in Abuja yesterday, Sheriff said: “I am ashamed at the way and manner Fayose is conducting himself in the country. I was once a governor; so, I know that the position of governor is a very serious one that demands responsible behaviour”. To buttress his claim to the chairmanship of the party, Sheriff said the National Working Committee (NWC) under him is in charge of the bank accounts of the PDP, not the Ahmed Makarfi-led caretaker committee. “Myself and the Treasurer who is also a member of the NWC are signatories to the bank accounts of the PDP. Makarfi may also open another account in the name of his caretaker committee if he wished,” Sheriff said. The former Borno State governor said he had forgiven Makarfi and his committee members for what he called their failed attempt to take over the party and invited them to rejoin the PDP under his leadership. Said he: “There is only one PDP, which is the one under my leadership. Anyone who thinks that the Makarfi, contraption can work is deceiving himself. I am the only chairman of the PDP recognised by the courts, the constitution and the Electoral Act. Sheriff inaugurated a committee to conduct a primary to pick a candidate for the party in the upcoming Edo governorship election. The PDP has hold a primary which Pastor Osagie Ize-Iyamu won. Sheriff named Senator Hope Uzodinma as chairman of the committee and a former presidential aide, Ahmed Gulak, as secretary. According to him, three aspirants have obtained nomination forms at N10 million each. The money had been deposited in the party’s bank account. Sheriff announced that he would soon convene the party’s National Executive Committee (NEC) meeting to ratify the candidature of the winner of the Edo primary election to be conducted by the Uzodinma committee. “After that, we will forward the name of our governorship candidate to the Independent National Electoral Commission (INEC) before the July 10 deadline set by the commission for the submission of candidates,” he said. Sheriff dismissed as false, claims by the Makarfi committee that INEC monitored the primary election it conducted, saying the commission had debunked the claim. With Sheriff were Uzodinma, Gulak, Senator Buruji Kashamu and Mrs. Mariam Ali. Others are former Imo State Governor Ikedi Ohakim; former PDP Vice Chairman (Southsouth) Dr. Cairo Ojougboh; PDP Southwest Zonal Chairman Makanjuola Ogundipe; a former Deputy Governor of Oyo State, Kasim Gbolarunmi; Senator Saidu Kumo; Mrs. Esther Audu. Also at the event were Prof. Wale Oladipo and Fatai Adeyanju, who are still laying claim to National Secretary and National Auditor.